Review: ICC World Twenty20: South Africa & Pakistan. There are rivals. Then there are giant rivals. And then comes the rivalry of the South African cricket team against the world events in the game of cricket. They may be one of the best team present around across any format. They may be renowned as the "Best travellers" in the world. But they always manage a way to dissappoint everyone when it comes to the knockouts of world events. Every budding cricketer thinks of playing for his nation at some point of time. When he represents the nation, the goal changes to winnng the biggest prize, i.e., The World Cup for the nation. The South African cricketers cannot be different. Many legends may have have come and gone. They may have achieved the feat of scoring 20,000+ international runs (Jacques Kallis) across formats. They may have achieved the feat of taking 800+ international wickets (Shaun Pollock) across formats. But the primary goal of winning the World Cup still remains unachieved. But it is never too late for anything. Who knows if this ICC World Twenty20 hand the Proteas their maiden World Cup? Who knows if they procure the World Cup after 127 years of emergence into cricket? South Africa, who are placed in Group 1 of this years World Twenty20 alongwith Sri Lanka, England, West Indies and one qualifying team from Group B will play their first match against England on March 18 in Mumbai. Faf du Plessis, their T20I skipper is also their best batsman in the shortest format with an average of 39.80 and a strike rate of 135. The all important No. 3 position will be handled by him. After making 97* in the last T20I vs Australia this week, Hashim Amla has cemented his place at the top of the order which means that Quinton de Kock will have to wait for his likelihood of opening the batting. Amla will be accompanied by the flamboyant AB de Villiers. But this is not where the problem ends. AB may have scored runs in heap in the past decade. He may have won Royal Challengers Bangalore, his IPL franchise, many matches single handedly. He may have earned the title of 'Mr. 360'. But cracking the T20I code is yet to be installed in his domain. He has the lowest average, 22.87, among the batsmen in the current team which is quite surprising. He will have to bank on his IPL experience and score heavily and quickly this time. It is a rarity for a middle order to contain all left-handed batsmen in cricket. But it might be the reality if JP Duminy, David Miller and Rilee Rossouw take the field on March 18 which they most probably will. The added edge with Duminy is that he can bowl his quota of 4 overs as a right-hand off-spinner which can be crucial if the wicket turns. The 'Killer Miller' is coming off a good series vs Australia. So the team would expect his form to continue. Rilee Rossouw has not been the most consistent batsman for the Proteas and may well be replaced by Farhaan Behardien, who being a right-handed batsman will aid the left-right combination in the middle overs. David Wiese will continue his role of a genuine all-rounder down the order. No matter the World Cup is being played in India, South Africa are expected to play no less than 3 seamers in Dale Steyn, Kagiso Rabada and Chris Morris. Dale Steyn's fitness will remain a matter of concern for the team management. They will not risk him in the initial stage especially when the in-form Kyle Abbott is also a part of the 15-member squad. Imran Tahir will play as a sole spinner unless Aaron Phangiso is given a go ahead of a fast bowler which appears most unlikely. 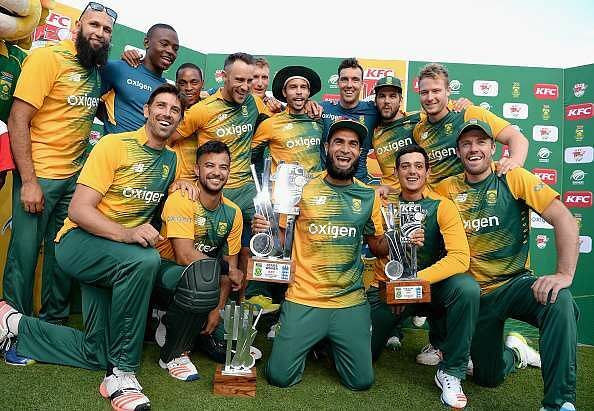 With the kind of team they have, if South Africa play to their highest potential, especially during the knockouts (if they qualify), they might well achieve the goal which they have failed to over the years. A lot has been happening in Pakistan cricket after the Asia Cup. Their participation in the World Cup was in doubt concerning matters of security of their players. With the kind of rich history India and Pakistan share, the suspense was always bound to be there. But all is well that ends well. Their match against the hosts, India, may have shifted from Dharamsala to Kolkata but the team is not withdrawing is an achievement in itself for both the nations. But this is not where Pakistan's problem has ended. If they had issues off the field, they more of them on the field. The recently concluded Asia Cup is the biggest example. They had not come out of their crumble against India on 83 when Bangladesh thrashed them by 5 wickets to wipe them out from the tournament. Their batting has lost it's sheen. Coming freshly out of the inaugral edition of PSL (Pakistan Super League), the batsmen were expected to score runs but the green turf in Mirpur always found them wanting against the moving ball. They have embraced the experience of Ahmed Shehzad in their squad at the cost of Khurram Manzoor. Shehzad, 24, will most likely open the inning with Sharjeel Khan who scored the maiden century of PSL in the semi-final against Peshawar Zalmi. This pair will be followed by Mohammad Hafeez who himself has experienced a slump in form. For some one of the experience of Hafeez, he will have to play the anchor role in building the innings. If the Pakistan team gained any positive in the batting departement during the Asia Cup, it was the form of Shoaib Malik and Umar Akmal. Malik, 34, has been among the runs in all formats since his comeback into the team and will look to carry forward his outstanding form in the World Cup as well. It has been almost 7 years since Umar Akmal made his debut but he still has not cemented his place in the side. He will have to work on his divergent form in order to play for Pakistan for the years to come and this World Twenty20 is the perfect platform for somone like him to prove that he is here for a long period of time. Pakistan have an added advantage in Sarfraz Ahmed, who is not only safe behind the stumps but is more than just safe in front of them as well. Lead the side with a positive frame of mind and not letting the debacle of Asia Cup affect them. Play the role of a proper No. 7 batsman. An in-form Shahid Afridi still has it in him to change the course of the game via his batting. The last and the most expected role would be that of bowling those 24 deliveries without conceeding many runs. You would expect this one from the highest wicket-taker (93) of the shortest format. He also has a chance to become the first bowler to take 100 T20I wickets. Whether Pakistan would include Mohammad Nawaz as the second spinner in place of a fast bowler will depend on the conditions. But what comes next is what Pakistan have never been short of, i.e., Fast bowling. Well, they have five options to choose from. Mohammad Amir has emerged as the leader of attack after the Asia Cup. He will be accompanied by Mohammad Irfan and one out of Wahab Riaz or Mohammad Sami which again will depend on the conditions in Kolkata where they will start their journey on March 16. The reserves in Anwar Ali, Imad Wasim and Khalid Latif, who have performed well in the PSL may be given a chance if the starting eleven does not play in the top gear. Will Pakistan repeat the magic of 2009 and become the only team to win ICC WorldT20 twice will only be known later this month.